The pride of Cornwall, the two finest schooners. 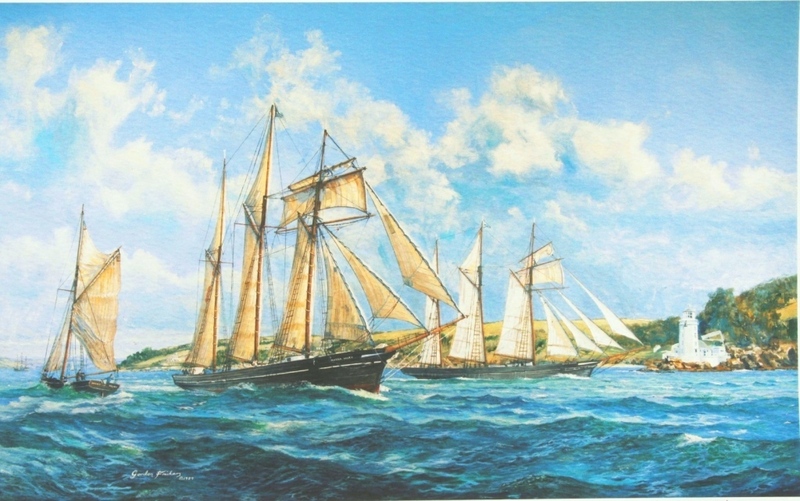 “The schooner “Jane Banks” leaving Fowey“ were typical running mates to “Rhoda Mary” and “Katie Cluett“. The set which would make a unique collection. “A dispute settled“. “Rhoda Mary“, “Katie Cluett” and the “Mary”. This family treasure has never been exhibited in public. It is though Available as a signed limited edition print. For years professional schooner men had argued about which ship was fastest. Most agreed it had to be one of the elegant pair “Rhoda Mary” or “Katie Cluett“, the fastest schooners and most elegant of the 3,000 ish British working topsail schooners of their day, but which was ‘queen of the seas’? This painting is a glimpse of the only day the pair, Rhoda Mary and Katie raced and proudly records “ Rhoda Mary ‘s” victory for posterity. “ Rhoda Mary ” and “ Katie Cluett ” were famous schooners as any reading of the story of the thousands of British merchant schooners soon reveals. It was said by sea men “ Rhoda Mary ” and “ Katie Cluett “, designed and built by the Ferris family, were the fastest and most elegant of the 4,000 ‘ish working schooners sailing from British ports between the 1870’s and 1930’s. All three ships named for sweet hearts, all built by members of the Ferris Family, two at Falmouth, one at Fowey. This painting’s dramatic, highly original composition was carefully researched including from family archives; more on the sources is at the end of this text. This painting is a glimpse of the only day the pair raced and proudly records “ Rhoda Mary ‘s” victory for posterity. “A dispute settled” was commissioned by Mr Frank Trebilcock, who lived as does his son today within walking distance of the mud berth were Rhoda Mary was built and the grave of her principal builder William Ferris. Mr. Trebilcock was a direct descendant of the families involved thus a descendant of William Ferris the builder of the winner. He lived near the site she was built (Devoran Creek). The painting has now passed to the gentleman’s son and likely to pass to his eldest son. A model at the time at Cotehele House Maritime Museum was useful as was ‘Merchant Schooners’ by Bazil Greenhill and the archivists at the National Maritime Museum Greenwich, London. I am too indebted to another good friend, Patrick Selman, sail maker, who took me to sea, to Falmouth bay in his Falmouth working boat ‘Agnes’ to check out the background details for this painting and for “Last Departure“. 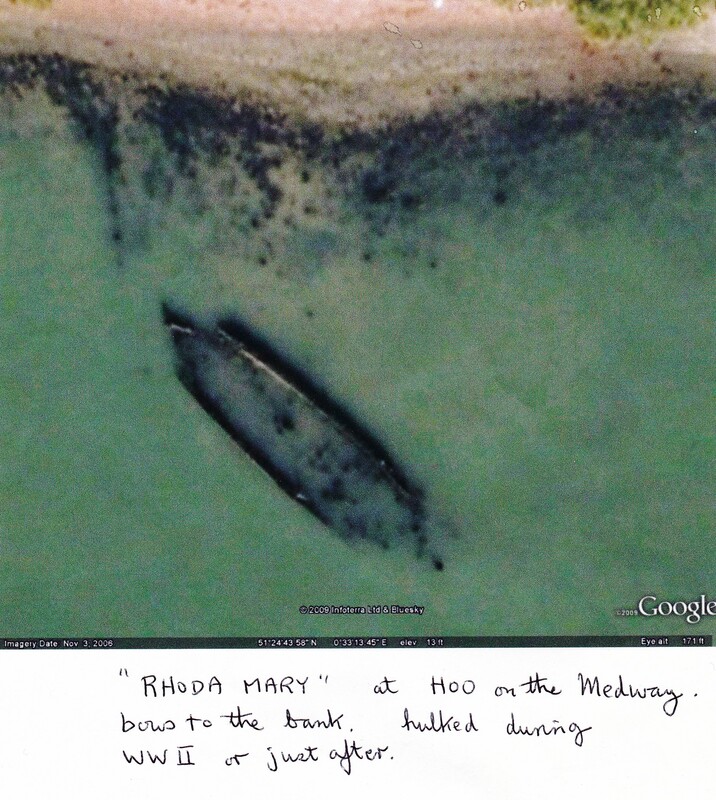 Rhoda Mary today, reverting to nature in the Medway estuary mud. Many a fine schooner ended her days that way after World War Two. There is a plan by a Truro boat builder to return her to the Fal and rebuild her. A campaign started in 2014 at Truro, Cornwall, lead by a local shipwright and boat builder to recover the wreck. I am told some funds have been raised and the project is beginning to look viable. The “ Rhoda Mary ” and “ Katie Cluett ” were undoubtedly ‘crack ships’, Cornish built in the rival ports of Falmouth and Fowey. Built and maintained to an equivalent standard to today’s super-yachts, “ Rhoda Mary ” and “ Katie Cluett ” were considered the “ Cutty Sark ” and “ Thermopylae ” of the coast trade, crack ships & very smart, the pride of their respective home ports Falmouth and Fowey. Rhoda Mary in common with all British working schooners passed most of her life in hazardous coastal trade, she is know to have voyaged regularly at least as far as Liverpool and Hull. The schooners were built by different members of the same Cornish family; built and maintained to an equivalent standard to today’s yachts. My connection with Rhoda Mary lives on via my treasured friend, the son of a descendant of her builder William Ferris, and the people who operated Rhoda Mary, he still lives near the site she was built (Devoran Creek). Fate: Abandoned, laid up on the river Medway mud. How this Cornish schooner be laid up on a Kentish river is a tale I’m yet to discover. I write (24.06.15) there is a scheme to recover and restore Rhoda Mary lead by the distinguished boat builder Luke Powell of Truro, Cornwall. I wish that team all the best of luck and will help as best if can if asked. The proposal is to recover the wreck of the “Rhoda Mary” from the Medway and rebuild her in Truro near her birth place. I am too indebted to another good friend, Patrick Selman, sail maker, who took me to sea, to Falmouth bay in his Falmouth working boat ‘Agnes‘ to check out the background details for this painting and for Last Departure. Although I have sailed those waters many times it still adds to the painting if I can see the location and make studies. This beautiful picture is reproduced to have the look and feel of the original painting, each copy is signed and numbered. Produced on finest cotton canvas using inks the manufacturer guarantees under normal circumstances for 70 years plus. 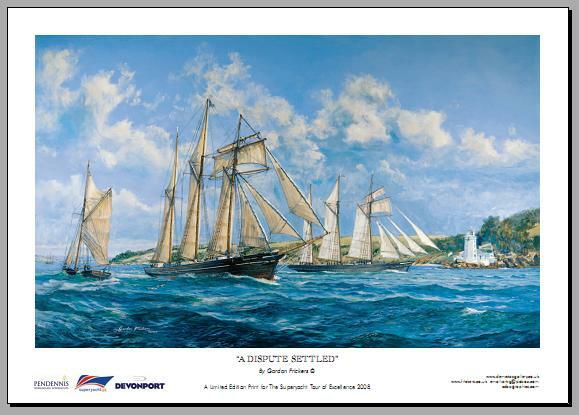 shown for the first time at Pendennis Castle and the picture chosen as a delegates memento for the British Marine Federation / Superyachtuk “International Tour of Excellence 2008”. Published as a greetings card by Gordon Fraser Gallery 1990 under a 5 year licence agreement. The National Maritime Museum (Greenwich and Cotehelle). There is a fine model of “Rhoda Mary“, last seen by Gordon Frickers and photographed with their kind permission (as the painting was to be for family descendants) in the National Maritime Museum annex at Cotehelle Quay. “Rhoda Mary” and “Katie Cluett” are mentioned in several books including the rare “Coastwise Sail” and Basil Greenhill‘s excellent “Merchant Schooners“. 126 tons built at John Stephens Yard by Peter Ferris, Fowey 1876, Official Number 73261. (Peter Ferris was a brother of William Ferris who built her great rival on the beach “Rhoda Mary” at Falmouth). 04,08, 1876 John Clark Isaac, merchant of Liskeard owner with 24 64 th shares. Fate: 1917 (22.12) stranded and sunk east of Dodman Point, Saint Austell Bay, Cornwall, her master who was also her managing owner was lost with the wreck. The Katie Cluett was the only ship commissioned by John Isaac and was by far the star of his fleet. According to ‘Ship and shipbuilders of a west country seaport, Fowey 1786-1939’. She was built by Peter Ferris at John Stephens yard at the site of the present day yacht club in Fowey in 1876. She was originally registered at 126 tons and two masted but was altered 15.8.1908 to 136 tons and 3 masts. According to Basil Greenhills ‘The Merchant Schooners’ ( I have a copy) almost all the people he questioned replied that the Rhoda Mary and Katie Cluett were the two fastest schooners, considering their performance and reputation over a period of years. Both Schooners were designed and built by the Ferris family. A model of the Katie Cluett was built by John Isacc (5) using the David Mcgregor plans of the Rhoda Mary. John Isacc (6) wrote: “he created his own basic plans for the other 2 based on basic dimensions of the ships and drawings of contemporary vessels. Whilst they may not be true representations they are beautiful models and nice to have in the family”. built Falmouth reputedly by William Ferris, less is known about this sturdy little sloop. We do know she spent much of her life in a regular local trade taking granite from the quarries along the very hazardous Lizard peninsular to Falmouth for building material so when you look at the older granite buildings in that famous sea port you may well be seeing stone transported by the little sloop Mary. Their second son is named John Clark Isaac (B 13.8.1782, D 12.2.1850) after his mothers’ family. He married Catherine Cluett (B 11.3.1791, D 22.2.1865) both living in Sturminster Newton. Two of their sons, the eldest John Clark Isaac (2) (B 13.2.1814,D 5.10.1887) and the youngest, Charles Isaac(B 7.6.1834, D 9.6.1917) became merchants (Messrs. J.C.Isaac and C.Isaac, coal merchants) based in Liskeard, the company being set up by John Clark, sometime before 1850 first at Truro and then Liskeard and Charles taking over.when John dies. Considering the age difference of 20 years and the death of their father when Charles was just 15 years old it seems likely that John would have taken on some of his fathers’ responsibilities towards Charles as he was growing up. This, and the fact that John never marries, may explain why the name John Clark is then passed on down through the generations from Charles Isaac. I am John Clark Isaac (6). There are 5 ships in the Fowey registry that were part owned by the two Isaac brothers and all but the first, Elizabeth Davy seem to have been named after their parents. The Foweyharbourhistory.com website shows the bare bones details, however the real story is much more complicated with1/64th shares being traded back and forth though out their life with various other family members having minority share along with others. Charles Isaac gains managing ownership of the John Clark and Katie Cluett on his brothers’ death. On the death of Charles Isaac in 1917 Alfred Prettyman, a shareholder and master Mariner, becomes managing owner and master of the Katie Cluett and is drowned when she founders on the Dodman. The Merchant Schooners Vol 1&2 Basil Greenhill. Crewlist.org.uk –Ships shown registered at Fowey in the mercantile marine 1910.